After the car, the bicycle is the most widely used means of transportation in Japan. Almost everyone Japan owns one. Bicycles are used to carry groceries from the market, to commute to school or work, or simply as entertainment. It is relatively easy, legal and free to park everywhere except at train stations. Because of the overabundance of commuters with bicycles, it is illegal to park outside stations. Many persist in parking there illegally since there is often no consequence. However, eventually the bicycle will get a warning and if illegal parking continues, it may be confiscated. At the station, the best place to park is at a special garage where one can park for a fee. 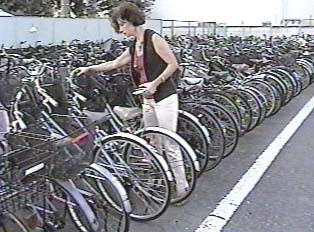 It is free to park your bike in a bicycle parking lot.